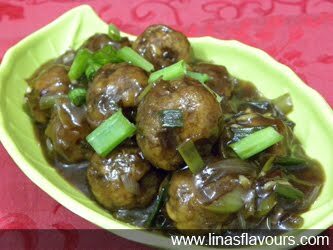 To make Manchurian balls, take a bowl and mix all the above mentioned ingredients except oil and mix it well. Add water as per the need. Take a frying pan and heat oil. Make small balls with hands and deep fry in batches. Keep it aside. Take a pan and heat oil. You can use the oil which is taken for frying. Add onions and saute it for about 2-3 minutes. Add capsicum, salt, black pepper, ginger-garlic paste, soy sauce, chilly sauce, tomato ketchup and cook it for about 2 more minutes. Add Manchurian balls and cook for 1-2 minutes. Garnish it with spring onions and serve it immediately. 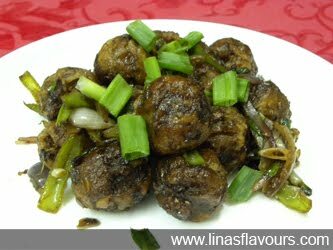 For Manchurian with gravy, add 2 teaspoon of corn flour in 1 cup of water and mix it well. Add this mixture to Manchurian balls and cook it for 1-2 minutes till it thickens.